Clarets defender Ben Mee admits the goal-less draw with Ipswich Town at Turf Moor on Saturday was probably a better result for their promotion rivals. But he was at a loss to explain why referee Peter Bankes had ruled out his first half “goal”, with most onlookers mystified at the decision. The Clarets picked up a ninth clean sheet of the season, with Mee again paired with Michael Keane at centre back. It was a third-successive shut out at Turf Moor, on the back of 4-0 wins over Charlton Athletic and Bristol City, but Mee said: “It’s a better result for them (Ipswich), I think, than for ourselves. “We needed to go and win the game. “It would have been nice to catch up on points with Brighton, who got beat on New Year’s Day. 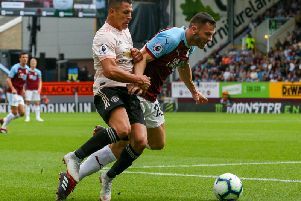 Mee felt the result was probably fair over the piece though, with Burnley squandering the best chance through Andre Gray: “It was a close game, not the prettiest of games but two teams battling it out. “It was a close game and maybe it was a fair result. “We might have just edged it with chances. “They’re a very organised side and physical. “Fair play to them, they’ve come here and got a point. Mee headed in David Jones’ first half corner at the second attempt, but what would have been the deciding goal was chalked off by Bankes, with most scratching their heads as to why. The former Manchester City man was similarly confused by the decision: “The referee said there were two fouls, but nobody really knew who he blew the foul for. “It was a strange one. “He (the referee) just said there were two fouls, he didn’t say who on – maybe the keeper. “A couple of lads said he just went to the ground. Bankes infuriated the home supporters, having earlier given nothing when Andre Gray was hauled down by centre back Tommy Smith, as he looked to burst clear after a slip from the Kiwi. Mee wasn’t in the mood to criticise the official, however: “He got his body in the way, but it’s one of them, it’s a close one. “I’m not going to start slagging the ref off.